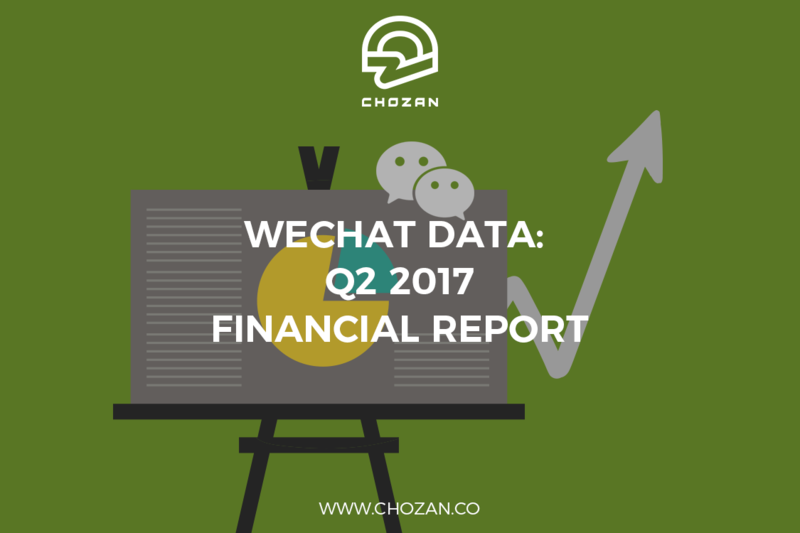 On August 16th, Tencent updated the latest WeChat data for monthly active users and summarized its recent performance in its financial report for Q2 2017. 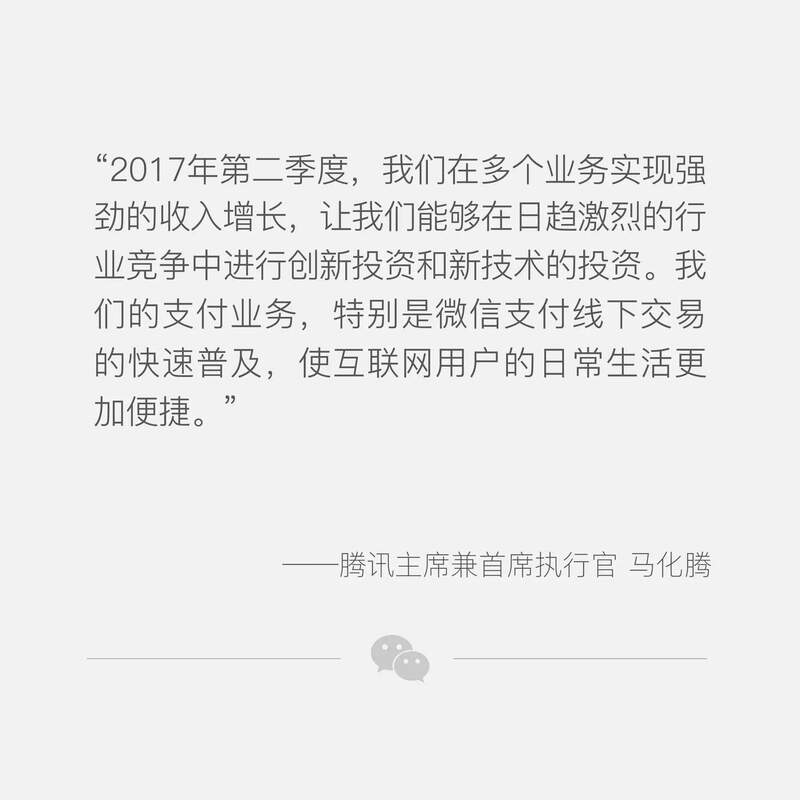 “In Q2 2017, Tencent saw robust growth in multiple businesses, which allows us to continue to invest in innovation and new technology while facing increasingly fierce competition. 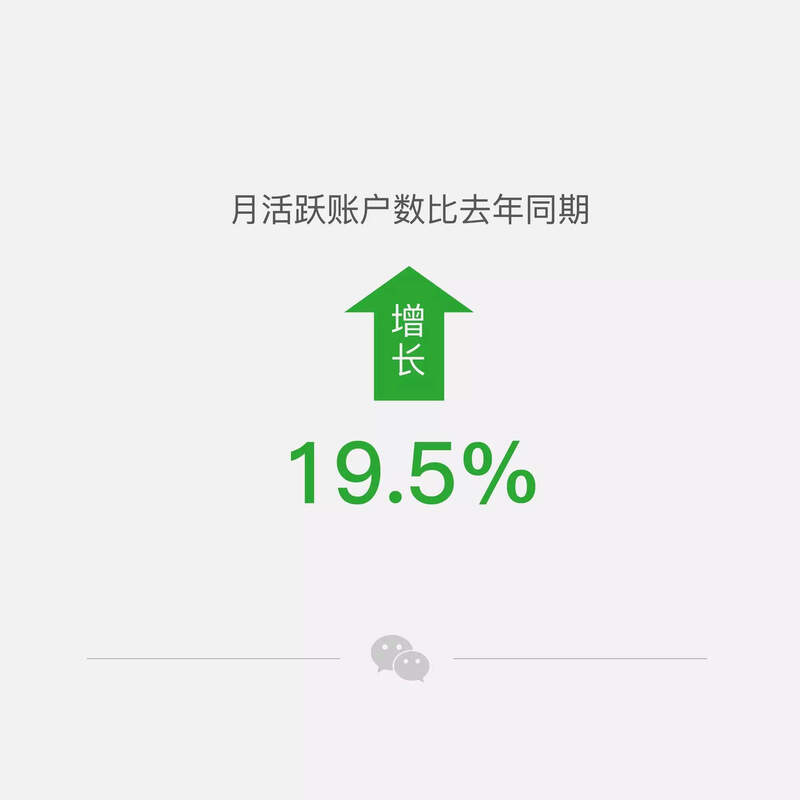 Our mobile payment services, especially the rapid popularization of WeChat Pay in offline transactions, have made the daily lives of Internet users easier and more efficient,” said Ma Huateng, aka Pony Ma, the founder, president, chief executive officer and executive board member of Tencent Inc.
● Monthly active users (MAU) of both Weixin (mainland version) and WeChat (overseas version): 963 million. ● The number of monthly active users saw year-on-year growth of 19.5%. ● Starting in Q2 2017, WeChat allowed users to find mini programs by inputting keywords or by using their location which has enabled users to access and use mini programs on a larger scale. ● WeChat Pay has been broadening its offline merchant base, while strengthening its cooperation with other partners including Meituan-Dianping (美团点评), China’s largest group deals site. WeChat Pay has experienced a rapid increase in mobile payment services for offline transactions. In early August, Tencent also released a report about mobile payment usage in China in 2017 based on a sample data set from WeChat Pay in 324 Chinese cities along with an online survey of 6,595 respondents. You can check it here: 2017 Mobile Payment Usage in China Report. ● By Q2 2017, Tencent’s advertising revenue from social media and other channels, including WeChat Moments, official WeChat accounts, and other apps developed by Tencent, has risen by 61% to 6.071 billion RMB. WeChat has also increased its advertising resources by lowering the subscriber threshold for “bloggers” on WeChat* and developing its self-service ad exchange platform that now allows advertisers to launch Moments ads to targeted audiences in first-tier cities. *“Bloggers (流量主)” here refer to official accounts with over 5,000 subscribers. 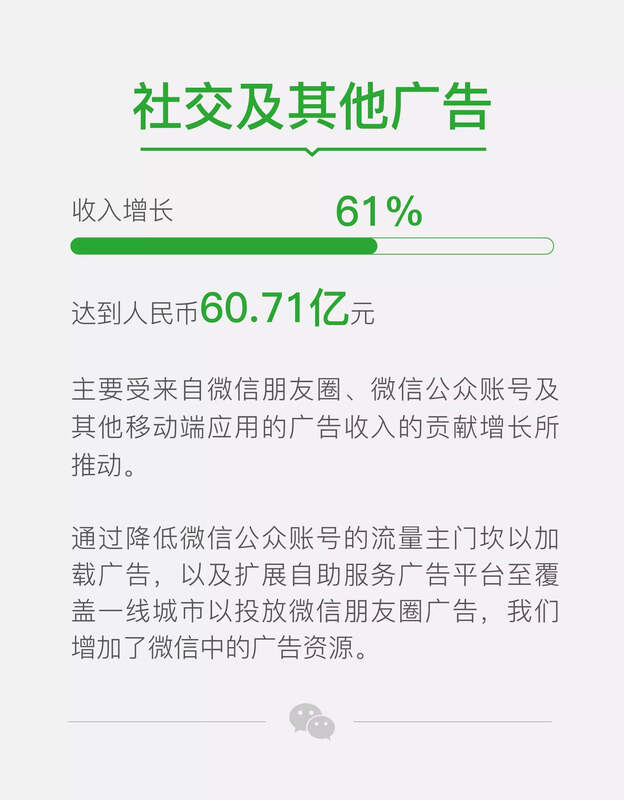 They can apply to have banner ads displayed under their WeChat articles (Account ads, 公众号广告). Previously, the threshold was 20,000 subscribers. ● You haven’t left any comments on their Moments page in the last 6 months. 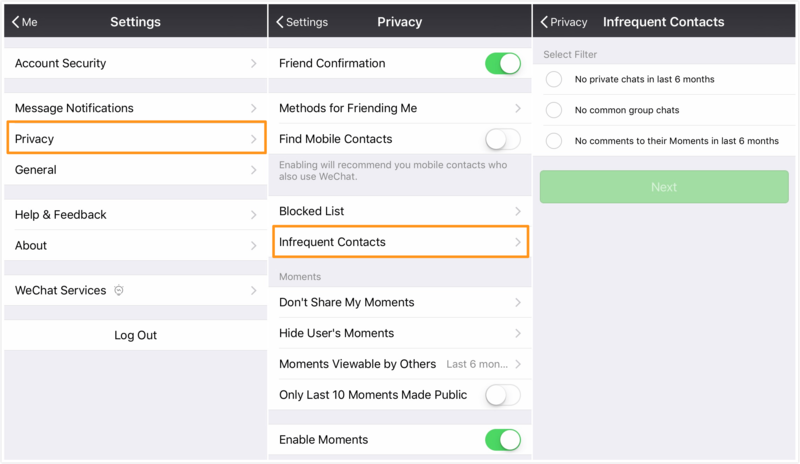 After users select one of more of these three parameters, WeChat will find contacts fitting the criteria so user can delete them. 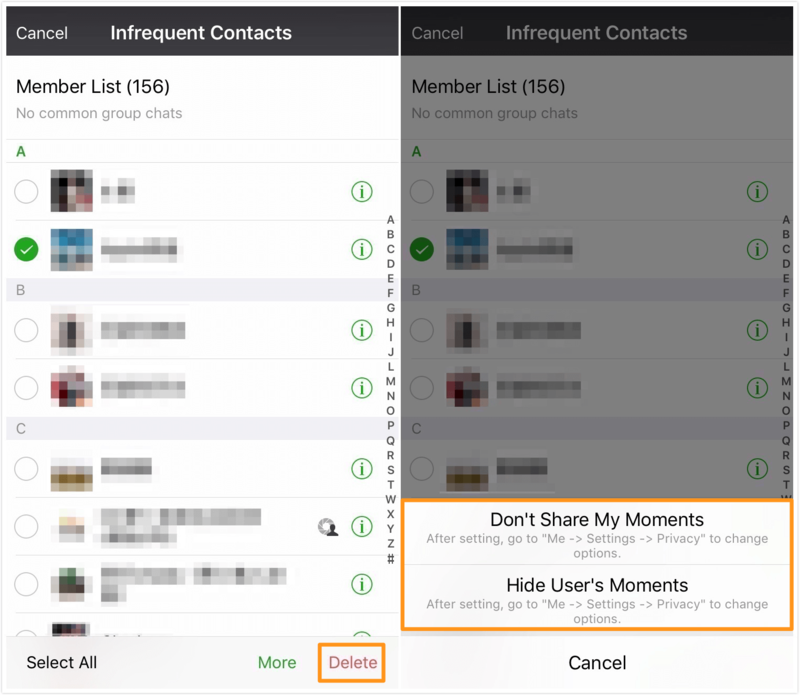 Alternatively, they can choose not to share their Moments posts with these contacts or they can hide these users’ Moments. 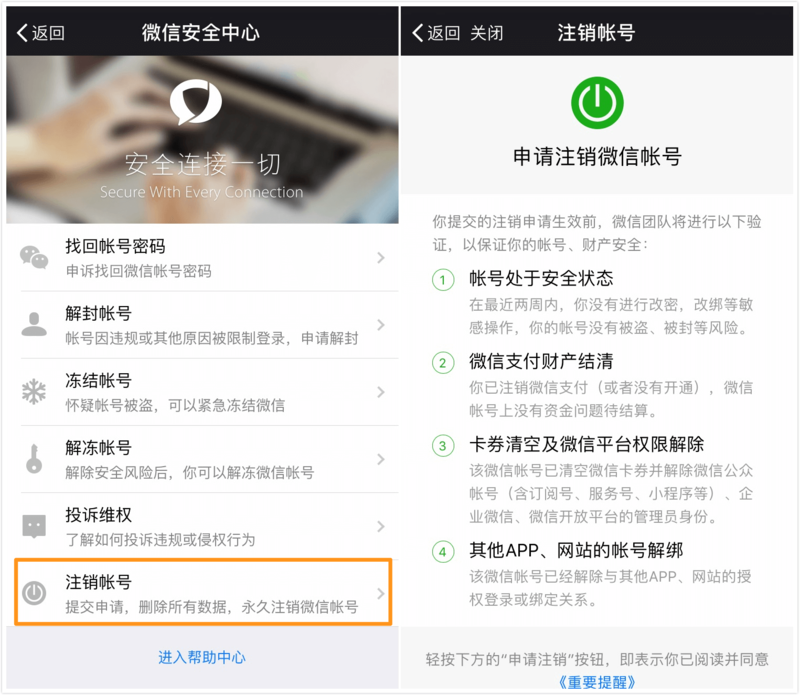 ● Your WeChat account is safe: You haven’t changed your password or your mobile phone number in the past two weeks. Your account is not at risk of being stolen or banned. ● Your WeChat Pay account payments have all been settled: You’ve closed your WeChat Pay account (or you’ve never activated it). There are no outstanding transactions that need to be settled. 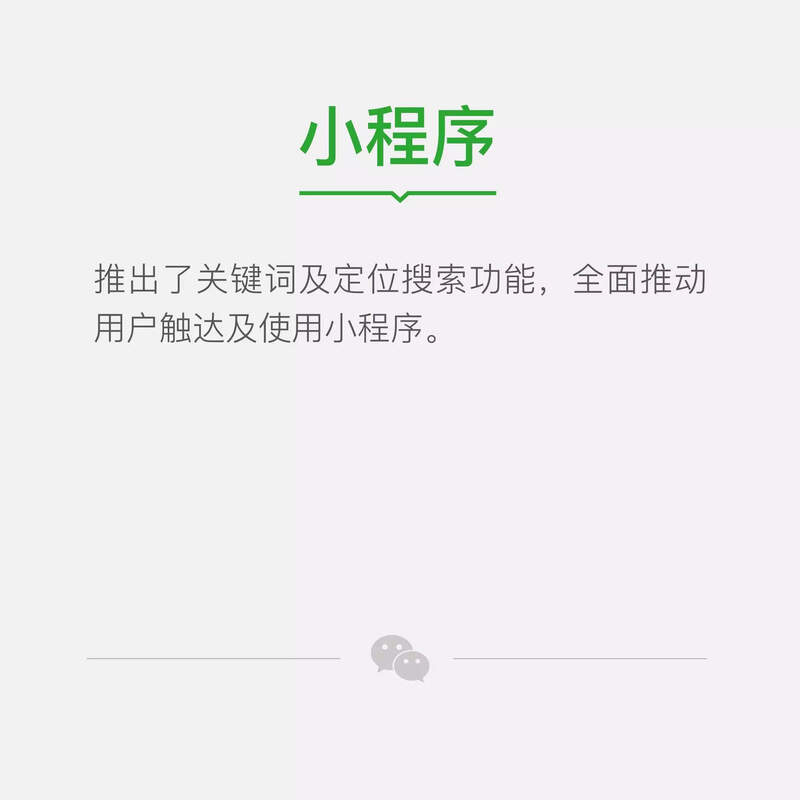 ● You have no unused cards and coupons and have removed your account from any official WeChat accounts (including subscription accounts, service accounts, mini programs), Enterprise WeChat, and WeChat Open Platform, of which you are the admin. 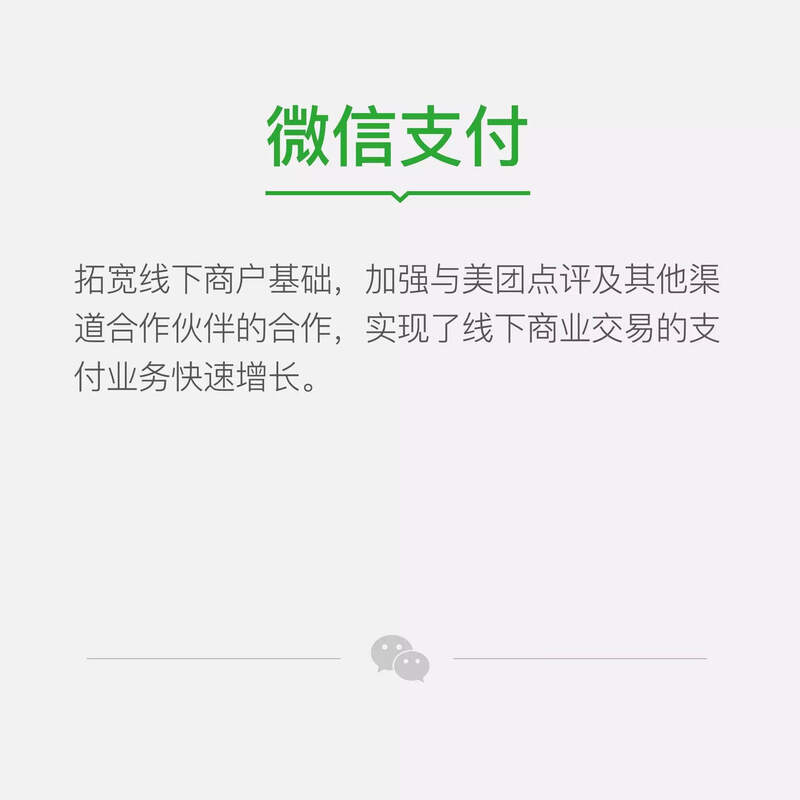 ● Your WeChat account is no longer bound with or used for automatic logins on other apps or websites. 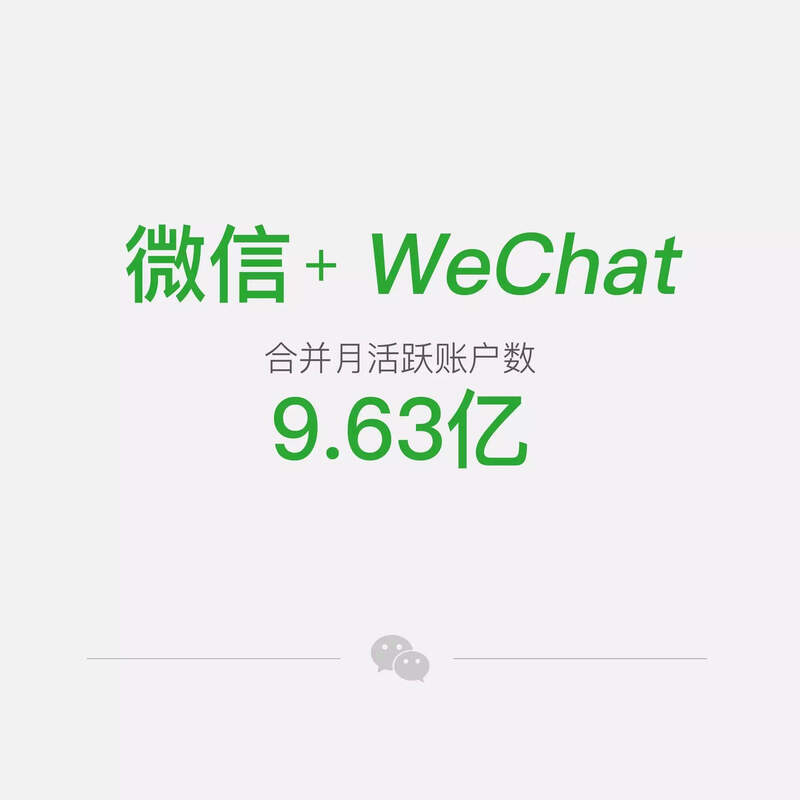 What do you think of the latest WeChat data? 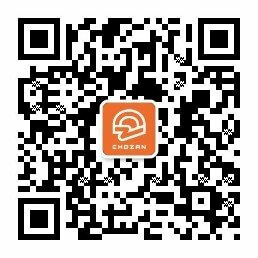 Have you ever tried mini programs or WeChat Pay? Do you think its “Infrequent Contacts” function is helpful? Leave a comment below. We’d be happy to answer any questions you may have. Next Next post: Weibo KOL Competition Case Study: Who is OPPO’s Photo King?